Crossing the Streams is a regular column that highlights exciting and enjoyable movies that you can find streaming on Netflix, Hulu, Amazon Prime, and VOD, providing you with plenty of great movies to add to your queue so you don’t waste time searching for something worthwhile. Typically these movies will be genre-based and geek friendly (though it’s not a requirement to be featured), and a large percentage of them will be independent and lower-budget productions. Chances are you’ve already seen every big-budget, top-tier movie out there; Kyle Dekker aims to bring you great choices beyond the mainstream. I enjoy a good zombie movie and lucky for me zombies have never been more prevalent in pop culture. Zombies have come a long way from their humble beginnings as a George A. Romero cult classic. One of my favorites is the 2006 film Fido. Most modern depictions of zombies in film, TV and video games focus on the survival and action aspect of a zombie apocalypse; The Walking Dead, Resident Evil World War Z (the film not the book). There have even been some nice comedic takes on zombies (Zombieland, Warm Bodies). Most of these modern takes of zombies are fun and/or thrilling but they lack what I enjoy most from the George A. Romero classics: the social commentary. Funerals are rare and expensive when you have to contend with the undead. Fido is set in a 1950’s/1960s idyllic America following a great zombie war caused by space radiation animating the dead. The film depicts a world of the white washed, baby boomer American dream—beautiful houses in bright colors, big cars, men in suits, and the good old American way. Underneath this veneer of supposed wholesomeness lies something sinister. 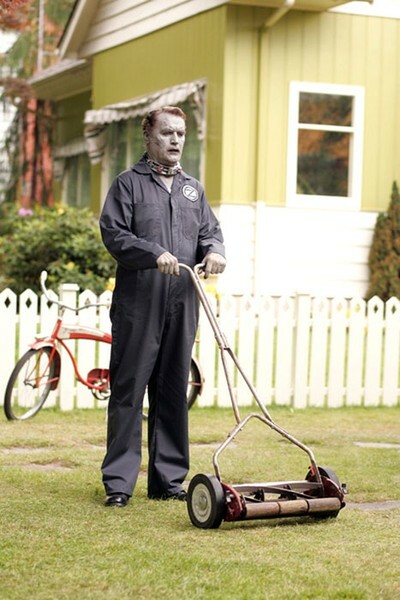 Zombies are used for manual labor and other menial tasks. The post-war world is filled with dystopian underpinnings that the film reveals more and more of as the simple but wonderful story progresses. 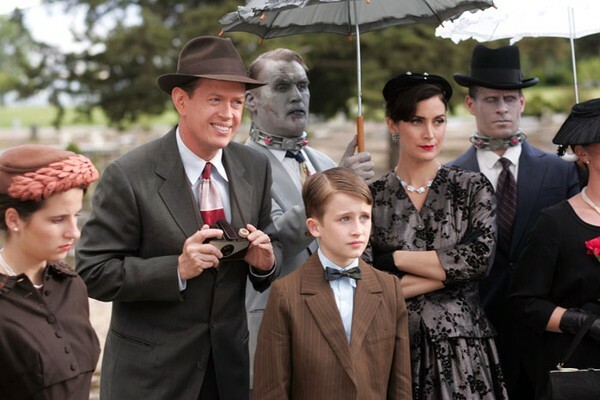 The story follows young Timmy Robinson (Kesun Loder), who lives with his parents Helen (Carrie-Anne Moss) and Bill (Dylan Baker)—typical suburbanites trying to keep up with the neighbors. Helen purchases a servant zombie from Zomcon, the all-pervasive mega corporation that appears to run everything. Servant zombies are a status symbol and Helen doesn’t want to be the only family on the street without one. Timmy befriends his family’s new zombie after the corpse saves him from some bullies. Timmy names his new undead friend Fido and they begin to bond. In an unfortunate disabling of Fido’s behavioral collar, he kills an elderly neighbor of the Robinson’s. This starts of a chain of events that creates the film’s central conflict of humanity and morality. The Robinson’s get new neighbors, the Bottoms. The patriarch, Mr. Bottoms (Henry Czerny), is a Zombie Wars hero and new town corporate rep for Zomcon. Mr. Bottoms is in charge of town security and maintaining the status quo. Mr. Bottoms is also a workaholic who is so focused on his job he neglects his daughter, Cindy Bottoms (Alexia Fast). Make sure to keep your zombie on a leash! Fido is highlighted by outstanding performances by Connolly and Moss. Connolly manages an amazing range of emotions while still staying stiff and undead. His facial expressions shine through the makeup and teeth prosthetics. Moss pulls off an incredibly charming and empathetic mother who wants the best for her family. She is tough as nails but both elegant and beautiful while slaying zombies. The production values of this film are incredible, especially consideringits very modest eight million dollar budget. The set design, cinematography, costumes and makeup are all top-notch. The film not only is fun, but it looks fantastic as well. If you want your zombie films to be fun, filled with social satire and packed with great performances, make Fido your next viewing. As of this writing it is available on Netflix streaming. Zombies even make great dance partners. Kyle is a Twin Cities based filmmaker and bad movie aficionado. Kyle is the executive producer of two Twin Cities-based geeky web series (Fang & Talon, Super Academy) and a dedicated tabletop gamer & father.